Today marks another milestone for the commons: the release of the 2016 State of the Commons, our annual deep dive and celebration of the global community working to further collaboration, creativity, and access to creativity and knowledge. This year’s report goes beyond data and metrics to focus on the people that power the commons in every region of the world. These stories illustrate how our movement is growing and evolving, driven by people who choose to share. The commons continues to grow, with the total number of CC licensed works now at 1.2 billion in 2016, including the increased use of licenses that invite remix, commercial use, and collaboration – up to 65% of all content shared this year. TL;DR: 2016 was our biggest year yet. From incredible sharing of 375,000 public domain works with the Metropolitan Museum of Art to our massive Global Summit, we’re seeing CC communities organize around renewed focus on movement building, free culture, policy reform, sharing, and global collaboration powered by gratitude. The commons is the largest collection of free and open knowledge in the world. In order to bring you this report, we’ve partnered with a handful of the hundreds of platforms that provide CC licensing to bring you more data and user spotlights in a new and attractive format. In October, we issued a Call for Submissions that asked our community to report on their favorite projects from the commons this year. These impact stories were beyond what we could have imagined: we heard stories of portals that use open data to predict and plan for earthquakes in New Zealand, a citizen-led civic data portal in El Salvador, a series of medical photographs that surfaces the untold struggle for independence against Portuguese colonial rule, and the “world’s most beautiful slideshow” of historic monuments submitted by over 10,000 Wikipedians. These examples, only a few of the many, tell the vibrant and life-altering stories of the people behind the commons. Highlights from our partners include the Freeharmonic Orchestra, a group of 12 musicians who met in a virtual room on the Free Music Archive to produce the most collaborative album ever. From our friends at Flickr comes the Multimedia Commons Initiative, where teams of researchers around the world utilize the epic 100 million image dataset to build new applications and explore people’s interaction with places. With the CC0 public domain dedication tool, we’re actively stewarding and helping grow the public domain, with 92.9 million public domain works to date. CC0 has served a diversity of purposes, this year most notably supporting the release of 375,000 digital works into the commons from the Metropolitan Museum of Art. CC0 has also supported photographers on emerging platforms such as Unsplash, which now hosts a robust community of photographers “giving their work away for free” and gaining exposure and acclaim in the process. These stories also echo the work we’ve been doing in areas like 3D printing, usability, and global community building. 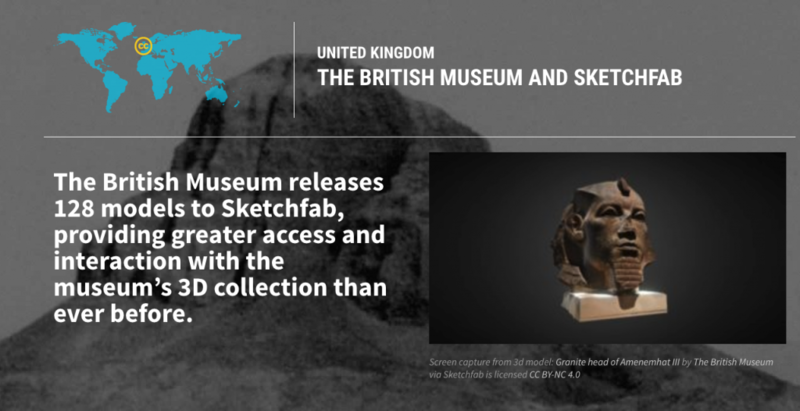 A spotlight on the British Museum, which released 128 models of sculptures from the Roman and Egyptian periods on the 3D design sharing platform Sketchfab and a tale of remix and community among the more than 1.5 million CC licensed objects on Thingiverse is proof that our community is front and center, and it’s working together better than ever. Lastly, the report itself was translated by 30 volunteers into a dozen languages as part of our efforts to make our community more accessible to international communities. Like everything else, we truly couldn’t have done it without you. Thank you so much for your support in 2016 and beyond. Read, excerpt, share, and tweet the report at http://stateof.creativecommons.org with the hashtag #sotc. This entry was posted in General and tagged CC License, Commercial Use, Data, Public Domain. Bookmark the permalink.